Please do not edit and/or distribute anywhere without my permission. 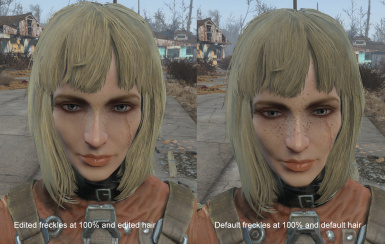 This mod just edits the first freckle complexion to be slightly smaller, lighter, changes some positions of the freckles, removes some and adds tiny ones (see screen for comparison) it also edits the long hair to be a bit more contrasting. Mostly did this for personal use but thought I'd share. 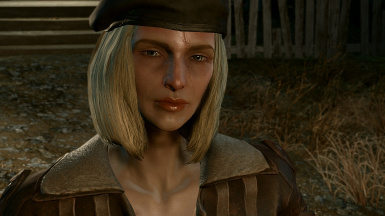 Note: The lighter freckles would probably look weird with other freckle complexions due to being... well lighter and smaller. If there is interest I may consider editing all freckle complexions and all hair textures. Just drop the folders into your Fallout 4 root folder where Fallout4.exe is located.